A chainsaw is often necessary if you like DIY projects or if you prefer to fix your home on your own rather than hire a professional. If you own a chainsaw with a chain that’s losing its edge, you may want to consider buying a new chainsaw chain. Simply buying a new chain is a much better option than buying an entirely new chainsaw and will ultimately save you money. 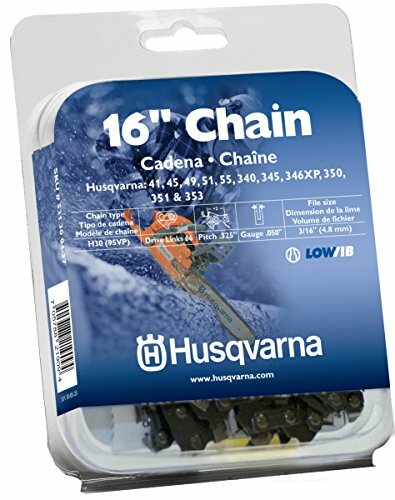 Finding the best chainsaw chains for your chain saw to replace the existing one is actually not complicated at all! There are a plethora of chainsaw chain options on the internet and if you’ve confused yourself with all the available choices, skip all the drama and just keep reading. In this article, we’ll be covering the top chainsaw chain brands, the best performing products (and their pros and cons), along with helpful tips that you can use to choose the right chainsaw chain for your needs. It goes without saying that you shouldn’t use just any chain that fits your machine. The problem with most chains is that they are meant to be used frequently. Keeping them aside for months at a time can damage the chain and also potentially damage your machine. 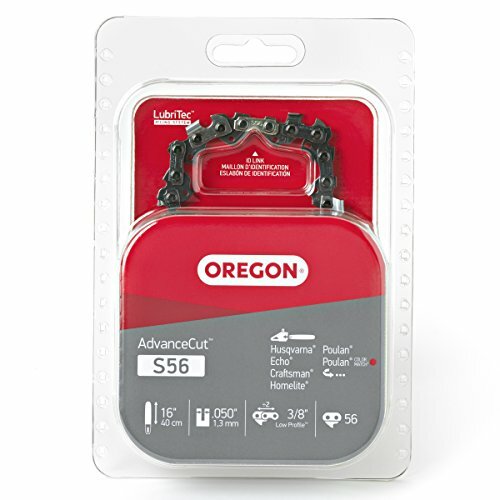 The Oregon S56 was built specifically for the “DIYer” and is advanced enough to handle some tough cutting jobs while still being very user-friendly. This chain was designed to be very flexible and will fit any 16-inch saw such as the Craftsman, Echo, or Remington. In terms of performance, the chain works brilliantly – like a hot knife cutting through butter. Overall, if you want a chainsaw chain that can work well with chainsaws of various brands, then this may be the right option for you. Buying this chain is also a smart decision if you have more than one chainsaw and want a chainsaw chain that would potentially work with multiple chainsaws. This chain is ideal for people who own a chainsaw and want a perfect fit. The customer service team of the brand is willing to help you decide whether it’s the right fit for you or not. You just have to share the model of your chainsaw, and you’ll get an honest and unbiased answer. 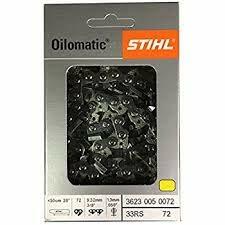 Stihl 33RS-72 Oilomatic Rapid Super Saw Chain, 20"
If you are looking for a smooth chainsaw chain that works seamlessly and quickly, then this could possibly be the one for you. The cutter and tie strap design of this chain will ensure that there is minimal vibration while its sharp edges see to it that you get quick results. Yet another great chainsaw chain option to consider, this chain is meant to offer high performance while keeping the vibration levels low. It is perfect for use in demanding conditions and can work effectively when you are on a timeline. 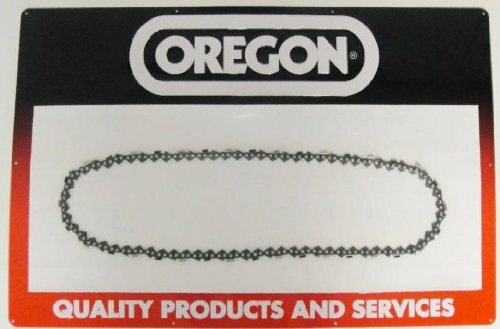 The great performance of this chain, smooth cutting action, and a nice chip flow are the features that make it unique. Costing less than 20 dollars, this chain also seems to be a value for money product. You also need to sharpen it often which might cut down the overall life of the chain. If you’re just beginning to learn how to properly use and own a chainsaw, then you may not have a clear idea of how to select the best chainsaw chains for when the old one wears out. For example, some people just starting to dabble with chainsaws make the mistake of judging a chainsaw on the basis of power only. This approach can be incredibly inconvenient, as the other elements like cutting, driving and connecting links also matter when choosing which chain is best. The chain pitch matters because the higher it is, the better it is for complex operations. You should remember why you need a chainsaw chain and its application before deciding the ideal chain pitch for yourself. For instance, 0.25 inches is suitable for people who need the chainsaw for gardening purposes only. In contrast, the pitch of 0.75 inches is ideal for people who use a professional chainsaw as a logging tool. If you want to work with a low power chainsaw, you should pick a chain that has a thickness of 1.1 or 1.3 (which is more common and works pretty well, too). However, If you want to use a chainsaw that is well suited for professional use, you will likely need a chain that is at least 2mm thick. Overall, as a general rule of thumb: the more powerful your chainsaw is, the thicker your chain should be. If you are looking for best chainsaw chains for domestic use, you should opt for a low-profile chainsaw chain. While designing chains for professional use, manufacturers usually try to create a balance between the number of pitches and profile height. For a small pitch, the manufacturers usually opt for a high profile and for a large pitch, they go with a low profile. If a manufacturer doesn’t comply with this balance, you might end up with a chainsaw that cuts quickly but doesn’t last for long. Though there are many types of chains, you may want to only consider the two most used options: chisel chains and chipper chains. Chisel chains are usually more suitable for professional chainsaws. The cutting of chisel chains is very accurate. However, sharpening such chains on your own can be difficult. In contrast, chipper chains are must better for domestic use and are ideal for people who don’t have saw sharpening skills (or just don’t want to do it). Another thing to keep in mind is that there are a few chains that are meant only for ripping and cross-cutting. Cross-cutting chains don’t need a sharp angle of sharpening because the wood resistance is less than ripping. Most people don’t need a ripping chain, as circular saws work just as well for ripping tasks. The recommended angle of chain sharpening for cross-cutting is 30 degrees while for ripping, it’s just 10 degrees. If your chainsaw chain has dull blades or missing teeth (and you’re reading this), then you’ve likely already begrudgingly come to the realization that it’s time to replace your chainsaw chain. Below, we’ve done our best to thoroughly explain the role played by the markings of a chain and the tail of your guide bar, along with the role played by both in choosing the right replacement. In most cases, the chain metrics are written in inches. It’s also worth noting that the pitch is not transformed into an imperial numbering system usually, and most manufacturers show gauge in metric form only. The biggest is .404, 3/8” while the smallest is 0.43” or 1.1mm. Some people use .375 instead of 3/8, which shouldn’t make a huge difference. When reading the information on the guide bar, you should seek the chain pitch. It will likely be .325”, 3/8”, ¼” or .404”. The chain pitch is essential because it lets you know about the distance between every other rivet in the chain. Similarly, you should also look for chain gauge, which is the thickness of the drive link which rums in the groove of the guide bar. The number could be .063”, .058” or .050”. If the numbers are in meters, they would be 1.6, 1.5 or 1.3 mm. The third thing you need to check is the number of drive links. For a 50cm guide bar, it can be 70 or 80. For a 30cm guide bar, it can be around 50. And for longer guide bars, there are no limits. Oregon was founded in 1947. They offer a variety of products like saw chains, guide bars, forestry accessories, sprockets, and other outdoor equipment parts. The company is a part of Blount Inc., an organization with over 3,000 employees. WEN is a brand that has been offering top quality and highly affordable power tools for a few decades now. The company was founded in 1951 and made its mark by merging tools with electricity. The company offers common tools like the electric jigsaw, electric engraver, electric soldering gun, wet wheel sharpeners, hand tools, generators, and much more. This company was founded in 1920 when people used tools by hand and hard labor, rather than the high-powered tools we use today. Andreas Stihl, the founder of the company, sought a better way to do things and designed a two-person electric chain saw in 1926. The high-quality products, amazing innovations, and great service quality sets the company apart and has made its mark in 160 nations. This company specializes in producing outdoor power products like lawn mowers, chainsaws, blowers, garden tractors, and snow throwers. People who like to do DIY projects are very likely to love this company’s products. It was founded in, amazingly, in 1689. 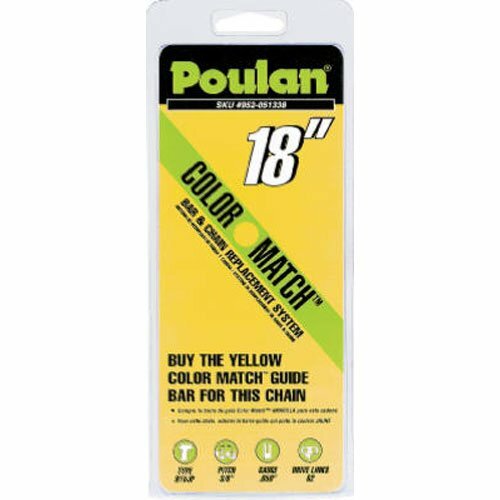 Poulan specializes in offering battery and gas-powered outdoor power equipment such as lawnmowers, pole saws, trimmers, chainsaws, garden tillers, hedge trimmers, blowers, brush cutters and many more. Is Buying a New Chain Smarter than Sharpening the Old One? It depends on how much use you have of the chain and how frequently you need to sharpen it. If you use it every once in a while, sharpening might be a cost-effective solution. In contrast, if you use the chainsaw regularly and you have to sharpen it every other day and spend a lot of time doing it, you might want to look for a new chain. What is a Characteristic of a Great Chainsaw Chain? A great chainsaw chain will start performing the minute it’s out of the box. You should also be able to fit it seamlessly and use it without any interruptions or fumbling around for hours. Should I Go with a Chainsaw from a Well-known Brand? Though it is advised that you consider a branded and compatible chainsaw chain if you can’t find one with a well-known brand, you can choose to buy a non-branded one. Compatibility should be given more preference than branding in most cases. Do I need to Work Hard if I Have Found the Right Chain? No, one of the signs of a perfect chainsaw chain is that it works seamlessly for your purpose without you having to put in excessive effort or force. How Should I Replace a Chainsaw Chain? If you have found the best chainsaw chain and you want to know how to replace it, you should read this guide. How do I Tighten the Chainsaw Chain to Ensure it Runs Safely? The process of tightening a chainsaw chain is easy. The process is explained in detail, here. Chainsaws are wonderful tools that can clear brush, dead trees, or aid in DIY projects, but when their chain blades get dull, it can pose a problem for chainsaw users. Finding a decent chainsaw chain for your tool is paramount to keeping your projects running smoothly. Hopefully, this guide has helped you to find the best chainsaw chain for your needs. If you have more ideas on selecting the best chainsaw chain, feel free to comment below. We’d love to learn from your experience and make things easier for everyone.